The PV150 Solarlink test kit includes the all-in-one PV150 installation tester - it makes proving the electrical integrity and performance of a PV system faster, safer and easier than ever before. With simple direct connections to PV systems, the PV150 performs open circuit voltage, short circuit current and insulation resistance tests at the press of a button. 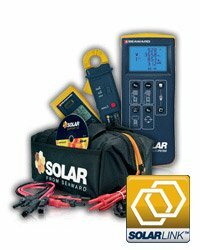 The Solarlink test kit also includes the Solar Survey multifunction irradiance meter, enabling irradiance and temperature measurement to be received and recorded wirelessly into the PV150 solar tester at the same time as electrical tests are conducted – a requirement of international standards and best practice, including IEC 62446, BS EN 62446 and EN 62446. With the Solarlink test kit, there is no need for several different instruments, at the press of a button the PV150 solar tester conducts all of the required electrical safety tests, and now Solarlink™ connectivity with the supplied Survey 200R multifunction irradiance meter enables the PV150 to wirelessly receive and record irradiance and temperature measurements in real time as required by international standards and best practise recommendations. The PV150 solar tester's internal memory can store up to 200 complete test records and USB connectivity allows for fast and simple download of time and date stamped records to PC for record-keeping, traceability and certification.